Thrive Sweet Cherries are the perfect union of sweet and sour. These cherries will add a flavorful burst to fresh salads and sweet desserts. 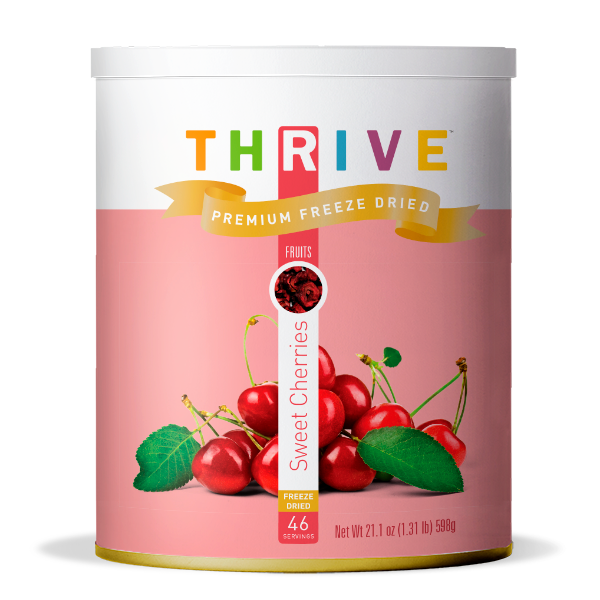 All Thrive Sweet Cherries are pitted and freeze-dried, so all you need to do is open the can and start enjoying the blissful taste. Spread out 1 cup Sweet Cherries on a plate or pan and spray with water from a spray bottle until thoroughly soaked. Wrap plate in plastic wrap and let sit at room temperature for 45 minutes. Use in cherry cobbler or fill Pillsbury crescent rolls with them to make quick cherry turnovers for breakfast. They’re also a great snack!